It’s the pop that no one ever wants to hear. The knee buckles, the athlete goes down, and the season is over. An anterior cruciate ligament (ACL) tear can be an abrupt and painful end to a season or even a career. It is a serious setback that usually requires surgery and leads to long term conditions such as osteoarthritis. 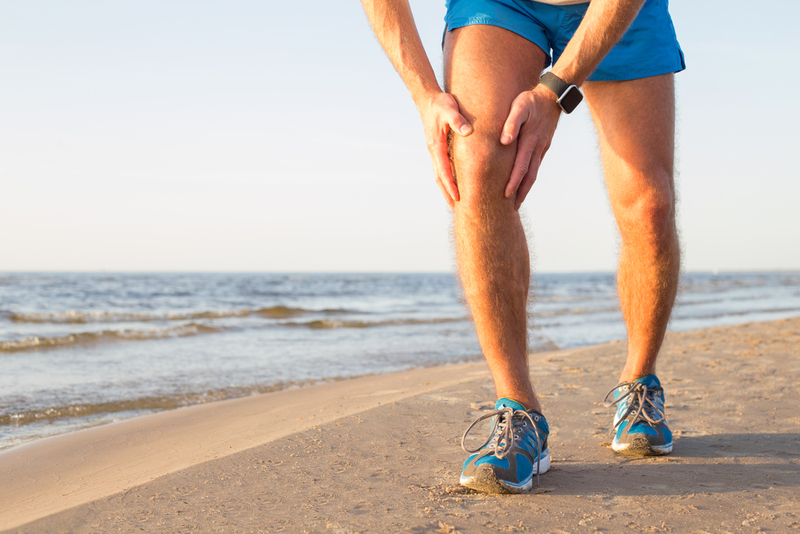 Your ACL is located in the knee joint and controls the movement of your shinbone in relation to the thigh bone. Direct impact, sudden stops and changes of direction, or turns and awkward landings are what most often lead to ACL injuries. The injury itself is usually indicated by an audible pop, a buckling knee, immediate swelling, pain, and an inability to put weight on the affected limb. Given the movements that most commonly lead to ACL tears, you’ll frequently find this injury in soccer, football, and basketball (among other similar sports). Preparation and body awareness go a long way in preventing ACL tears. This includes properly warming up and stretching before all workouts, understanding proper body positioning (stance, how you push off and land, etc. ), and avoiding “playing through” knee pain which can lead to overuse injuries and weakness. As with most injuries and conditions, good nutrition and proper hydration are important parts of keeping ligaments healthy and strong. Eating lots of colorful fruits and vegetables, lean proteins, nuts and legumes will help ensure that your ligaments get the protein, calcium, and other nutrients they need to stay strong and protected from injury. Diet and nutrition are one of the most overlooked aspects of injury prevention. The ability of your ACL to withstand athletic activities without injury depends in part on the strength, flexibility, and health of the surrounding muscle groups. It is important to strengthen the hamstrings. It is also useful to think of the entire chain of muscles involved in a given movement. Working to improve balance, agility, flexibility, and core strength will help you control the body and eliminate the need for compensatory movements that sometimes lead to injury. For people at risk of ACL tears, such as those with previous knee injuries or older adults, there are ways to exercise while lowering the body-weight impact on the knees. Pool training, for example, is a highly effective (and taxing!) way to continue training while reducing the risk of knee injury. For the purposes of training, therapy, and injury recovery, precision unweighting tools like the AlterG Anti-Gravity Treadmill™ are a highly effective way to reduce the body-weight impact on the knee. One patient, a Division I soccer player, suffered a severe ACL tear and completed a walking program on the Anti-Gravity Treadmill. The progressive loading and gait monitoring allowed her to recover, maintain cardiovascular fitness, and return to her sport sooner than expected. Read the ACL tear case study.